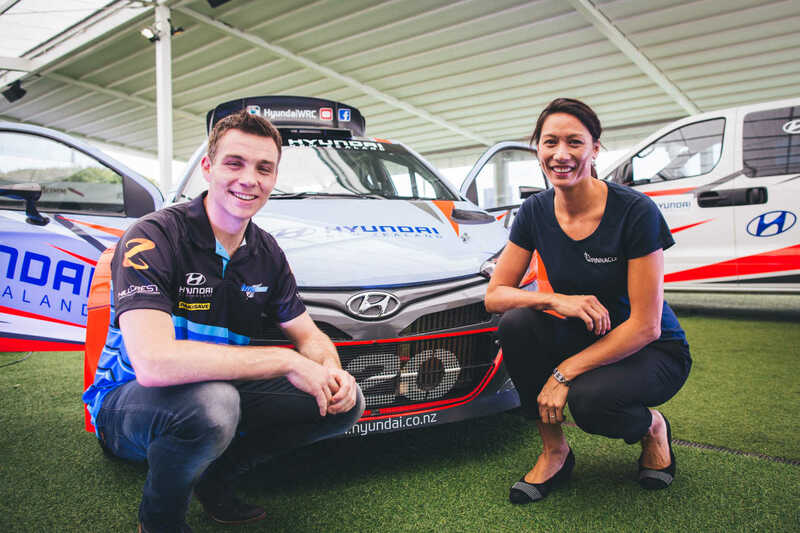 New Zealand’s world rally star Hayden Paddon has joined forces with Hyundai New Zealand to give a young Kiwi rally driver a major step-up with their rally career aspirations. Paddon and Hyundai New Zealand have collaborated to create the Hyundai NZ Young Driver Shootout and Scholarship with an impressive prize for the winner – the opportunity to drive the Hyundai NZ AP4 i20 rally car in two rounds of the 2017 New Zealand Rally Championship being operated and run by Paddon Rallysport, testing and training with Paddon, plus the potential for an expanded programme in 2018. Paddon, who is New Zealand’s most successful rally driver and currently holds fourth in the FIA World Rally Championship’s drivers’ standings, says he is passionate and driven to help the growth of New Zealand rallying. “The Hyundai NZ Young Driver Shootout and Scholarship is the first step of a plan created earlier this year. We want to help grow the sport and help develop the career of a talented young driver – to give a leg up to the next potential Kiwi international rally star,” Paddon says. Hyundai New Zealand General Manager Andy Sinclair shares the same vision and passion as Paddon to grow the sport of rallying in New Zealand while searching for new young talent. Andy Sinclair explains, “It’s incredibly hard for Kiwi drivers to make their way to the highest levels in this spectacular global sport. Applications are now open and can be found at – http://pinnacleprogramme.co.nz. Follow the instructions online and submit your application and details as prompted. Applications close 19 October 2016. Follow the instructions online and submit your application and details as prompted. Applications close 19 October 2016. Open to drivers aged 16-25, applicants for the Hyundai NZ Young Driver Shootout and Scholarship need to have contested a minimum of 10 rallies, including four pace-noted rallies. Paddon and nominated personnel from Hyundai New Zealand will choose five finalists who, with their co-drivers, will attend a two-day shootout course in Auckland in December. Paddon and nominated personnel from Hyundai New Zealand will choose five finalists who, with their co-drivers, will attend a two-day shootout course in Auckland in December. The course offers the finalists and their co-drivers a day learning from Paddon’s experience getting to the top of world rallying with theory and advice on fitness, sponsorship, media, car set-up/driving and pace notes. The second day will be in the forest, where finalists will drive the Hyundai NZ i20 AP4 rally car to each set a benchmark time, as well as practical experience writing pace notes with Paddon providing advice in the car. A judging panel of five, including Paddon, will assess each driver/co-driver on all aspects of their performance and participation throughout the shootout. A judging panel of five, including Paddon, will assess each driver/co-driver on all aspects of their performance and participation throughout the shootout. “It’s not just about the fastest driver,” says Paddon. “We’re looking for the whole package – personality, motivation and ability to learn and improve, as well as outright performance during the shootout. The winner may not necessarily be competing in the New Zealand Rally Championship at this stage – we are looking for someone that stands out and has the X factor. The winner may not necessarily be competing in the New Zealand Rally Championship at this stage – we are looking for someone that stands out and has the X factor. Paddon adds: “To have Hyundai New Zealand as a key partner in this project allows us to provide a support structure and platform to help develop young talent. We haven’t had a scholarship of this magnitude in New Zealand rallying for some years. I was lucky to receive support through a similar scheme – the Rally New Zealand Rising Stars Scholarship – six years ago which helped me to give a leg up in the Production World Rally Championship. We see this as an opportunity to do the same thing for another young Kiwi driver. I was lucky to receive support through a similar scheme – the Rally New Zealand Rising Stars Scholarship – six years ago which helped me to give a leg up in the Production World Rally Championship. We see this as an opportunity to do the same thing for another young Kiwi driver. Applications for the Hyundai NZ Young Driver Scholarship are now open!